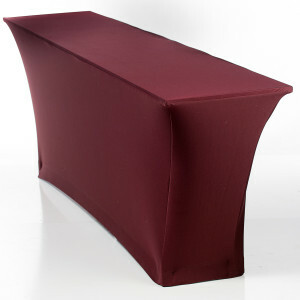 SnugFit are form fitting covers that are modern and sleek. They have a stretched look and they silhouette the product. SnugFit attach to table legs and are machine washable. To ensure proper fit when ordering rectangles specify distance between the legs. 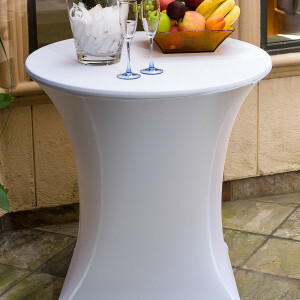 When ordering cocktail tables specify the number of legs on the base. Fitted toppers can be sold to provide contrasting colors. Scuba is a heavier fabric with a matte appearance. Spandex is a lighter fabric with a shiny finish. Spandex is a commonly used fabric for swim suits and biking shorts. Spandex is a fabric, not a style. The images below are examples of two products with the fabric style. Made with custom footholds for perfect fit. Shiny finish. Nylon/Spandex blend. 60" wide fabric. Machine washable/dryable.